A newsgroup question asked whether you can send an email from a Visio shape, so I thought it was time to document an example of just that.. However, I have used the Screen Tip cell for the message body because it is the only out-of-the-box dialog that allows you to enter multi-line text into a Shape Cell. To open the Screen Tip via the right mouse menu, I added the formula =DOCMD(1685) to an Actions row. That’s it! 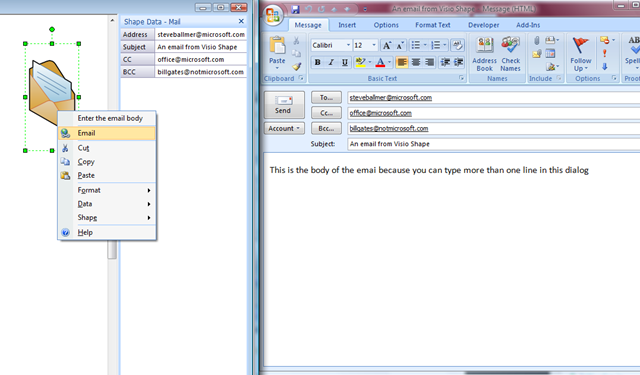 Just enter email addresses, a subject and body, then your mail client will be opened pre-filled from the right-mouse menu of the VIsio shape, or, of course, from a SaveAs web page.